Here’s a quick and easy weeknight treat to use while we’re getting all this wonderful asparagus! The trick to cooking asparagus is to use high heat and only a few minutes- you want to maintain its wonderful snap! The easiest ways prepare asparagus is to hold each stalk by the root end and the center and bend until it breaks naturally. Once you have removed all the fibrous bases, you’re ready to cut the asparagus to whatever shape you need. I’m also a big fan of raw asparagus, so if you’re feeling adventurous, consider slicing it very thinly and adding it to salads! 1. In a wok or large skillet, heat the oil until you see faint wisps of smoke. Add the shiitake mushrooms and cook until they all appear more vibrant, about 3 minutes. 2. Add the asparagus and yellow onion to the pan. Cook another 3 minutes, stirring ingredients. 3. Add mirin to the pan and toss the vegetables until the mirin has evaporated. 4. Remove the pan from the heat and place vegetables in a serving bowl. 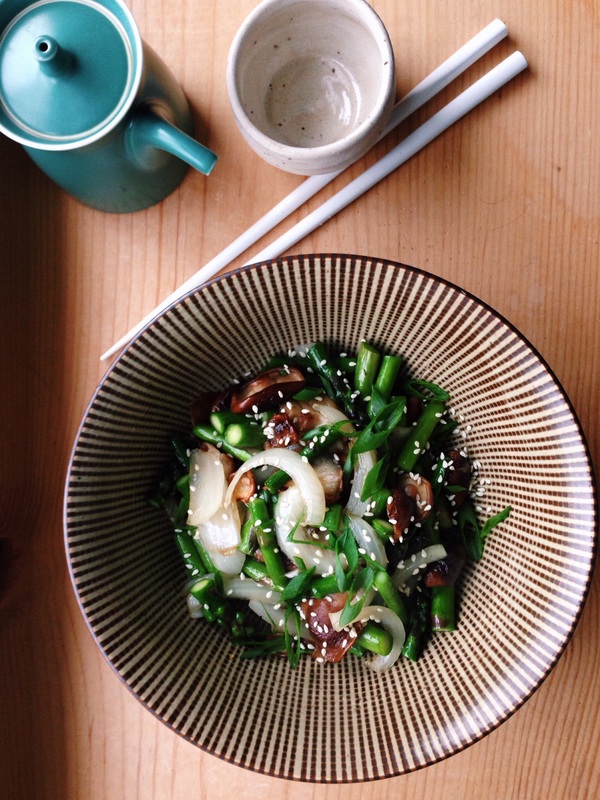 Top with green onions, sesame seeds, and a drizzle of soy sauce. This is delicious served over rice. 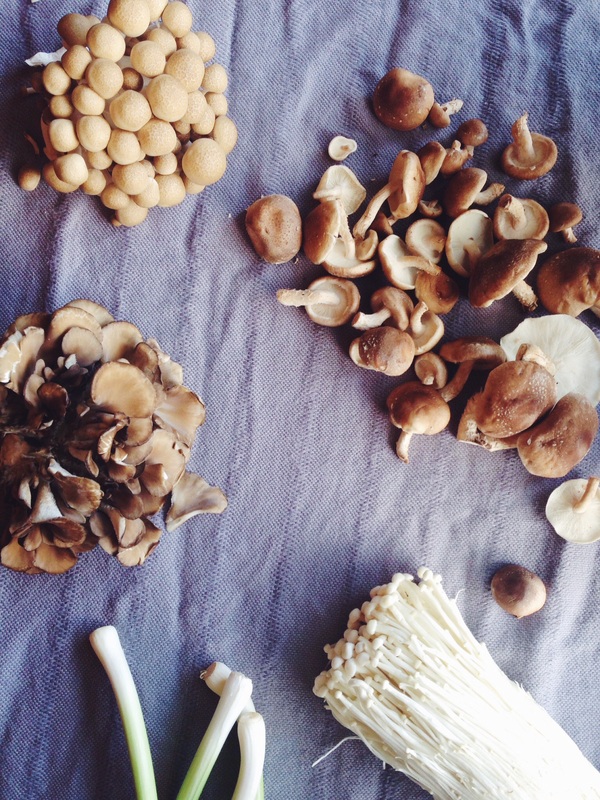 Clockwise from top left corner: shimeji, shiitake, enoki, green garlic, and maitake mushrooms. Spring in Seattle is such a fickle season- one second it invites you to fire up the barbecue, the next you’re ready to snuggle up in your favorite sweater. Here’s a recipe for the rainy days. Hot pot or nabe is a Japanese style soup that is shared by many people. A large simmering pot is usually put in the center of the table and family and friends are invited to dish up from it into their own bowls as they enjoy its nourishment together. This version celebrates the mushrooms of the northwest and is a wonderful way to enjoy the emerging bounty. When we make this at home, we place an electric hot plate on the table and use it to keep the contents warm in a Le Creuset. If this isn’t an option for you, cook on your stove top and dish up into bowls when ready. This recipe serves 4 people. Note: all these ingredients are available at your local Asian market. In Seattle, I always shop at Uwajimaya in the International District. Optional: udon noodles or white rice, cooked and available to put into individual bowls. In a large measuring cup or bowl, combine mirin, sake, soy sauce, sugar, and dashi. 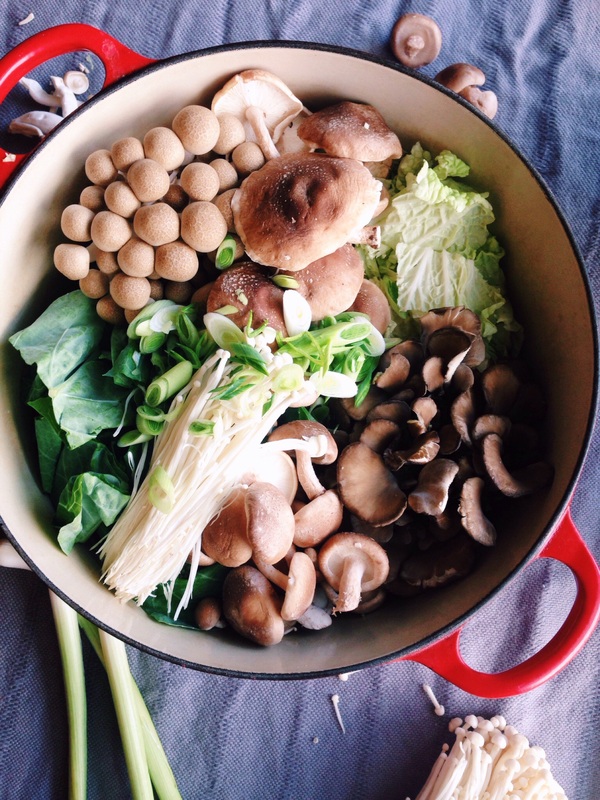 In a large Le Creuset or soup pot arrange all mushrooms and vegetables, making it easy for diners to choose what they would like to dish into their individual bowls. Pour liquid ingredients into pot, cover, and bring to a simmer over medium heat. Cook for 5 minutes. Transfer pot to the hot plate (set to low heat) or dining table, uncover, and enjoy with family and friends. Serve with white rice or udon noodles.